← Calan, Calon and Cariad! I have NO idea where the time has gone, but maybe the blog will go some way as to explain why I’ve been so sidetracked! As those of you who follow these blogs may know……..and I hope there are one or two of you……….little Gruffudd’s star shot into my orbit last June and there has been some realigning going on because of his comet-like appearance. I’ve always loved looking up into the skies at night and gazing in awe at the various constellations and clusters of bodies twinkling away in the heavens – and Gruff’s arrival has enabled me to spend many sleepless nights as his body clock has been acclimatizing itself with his new world. My mobile phone has a really cool app called Google Sky Map and I’ve found myself in the early hours standing in the back garden during my sleep’s interruptions pointing my phone at the various stars and marvelling at their existence. I’ve lost count how many times Louise has called me into the house in case the neighbours thought me weird! 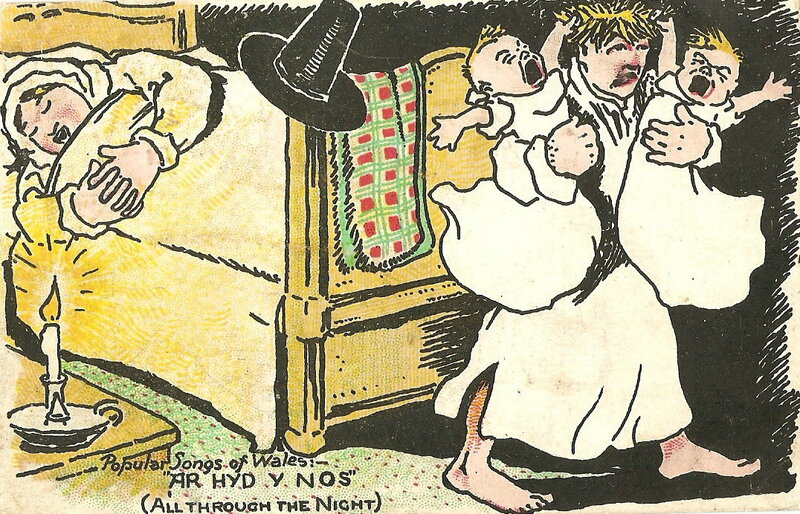 My previous blogs will show you that I’ve a large collection of Welsh-themed postcards dating from as far back as a hundred years or so and amongst them is one from 1905 which has some resonance with the past few months for me! And I’m sure to a certain museum director I know too! This postcard comes from a selection that plays on the titles of famous Welsh songs and the one in question here is Ar Hyd Y Nos ( pron. ahr hid uh norse), which is translated into English as “All Through The Night”. The song is an old Welsh tune officially first recorded in print in 1784, but the lyrics were written by my favourite poet, John Ceiriog Hughes, more popularly known as Ceiriog (pron. KAYR-ee-og) around 1860. Now many see his work by today as being rather sentimental in feel, but I absolutely LOVE his poetry because he certainly knows how to pull on the heart strings by describing the simple things of life in simple language. His poems were often used during the cultural gatherings of the Welsh in the Slate Valley as his lyrics leant themselves easily to songs of longing and nostalgia that enveloped and consumed the souls of every Welsh man and woman who found themselves having left home to pastures new. We have a word for this emotion in Welsh, hiraeth ( pron. HERE-ighth). It cannot be translated sufficiently into one word in English, but by gosh…….did Ceiriog know how to cause it. A study of the programmes at the Welsh meetings in the Slate Valley shows you that Ceiriog’s work was an essential inclusion if a gathering was to be successful. The photo below has him sternly looking into the camera, but his poetry could be as gentle and refreshing as the trickle of the mountain brook he so famously wrote about in another poem. The past month or so has seen me watching with interest Jupiter gradually working its way around Venus in the sky. Both can be clearly viewed in the vast dark of the sky. And each time I look at them I think of Ceiriog’s wonderful lyric to the twinkling stars in Ar Hyd Y Nos. I absolutely love Bryn Terfel’s rendition of it in his collection of Welsh songs for Deutsche Grammophon – it’s hauntingly beautiful – and one to enjoy in a darkened room looking out into the night sky. I cannot find a copy of it on the web to play you, but possibly this version will give you an idea of its magical feel. The lyrics talk of the twinkling stars showing the world the wonderful future ahead of us in eternity once our time on earth is past, but there is also an English version of the song written some years later which has a different storyline altogether. The English lyric is a lullaby, which is probably the version I should sing to ease Gruff back to his slumber! The Welsh word for “star” is seren (pron. SEH-rehn); the word for “stars” is sêr (pron. sair). 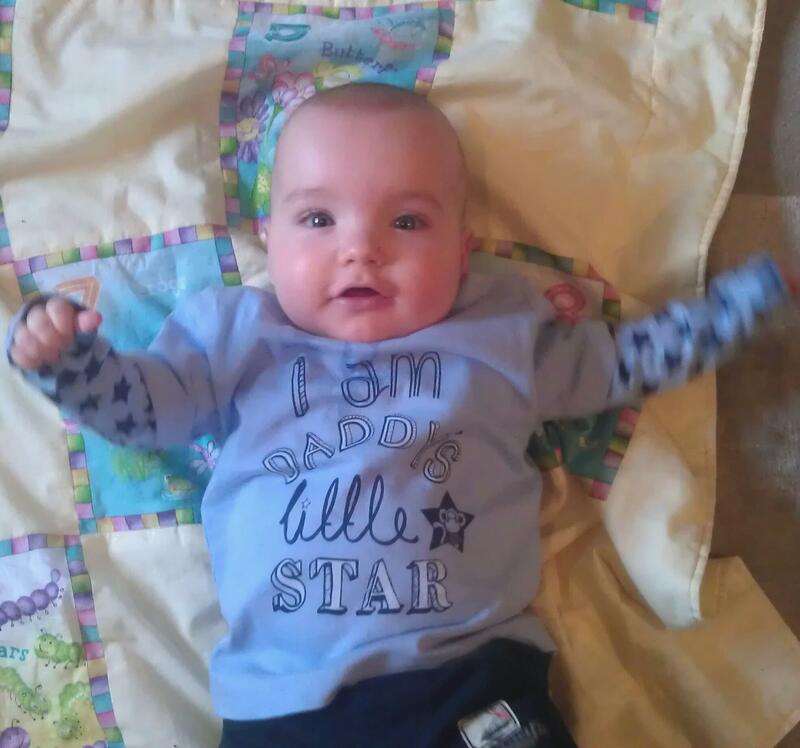 Actually, seren is rather a popular girl’s name in Wales at the moment…….I have a niece called Seren! Middle Granville was also the home of a very colourful character who came over from Bethesda, North Wales to work in the quarries of the Slate Valley. 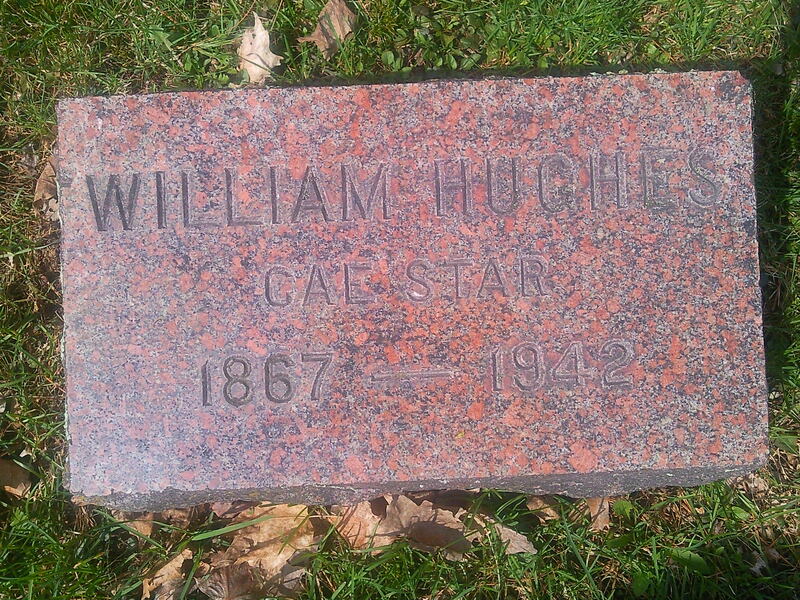 His name was William Hughes, but he was more well-known as Wil Cae Star, Will Star Field. A fearful man, who was quick to use his fists, especially under the influence of drink; but Wil was one of the many affected by the religious Revival of the early Twentieth Century and he became just as fierce in his Christian zeal once the Spirit had got hold of him! 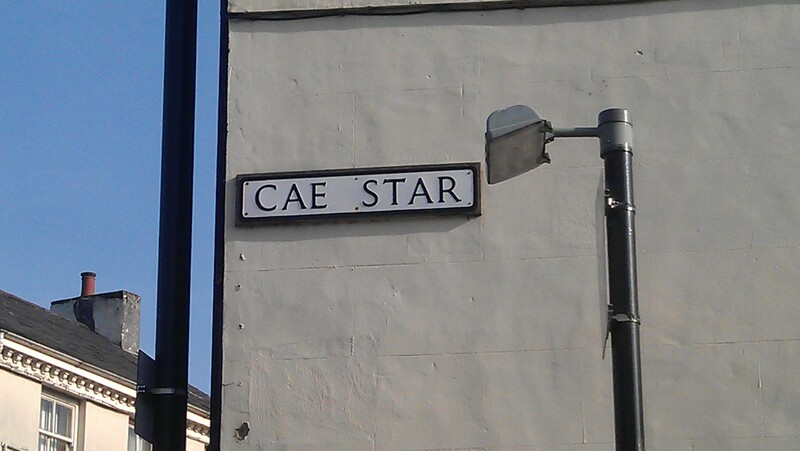 The name Cae Star still adorns the walls of Bethesda as seen below. His daughter, Neli, was Ellen Hughes Qua, author of the autobiographical “Growin’ Up in ‘Middle'” which was published to coincide with the opening of the Slate Valley Museum. 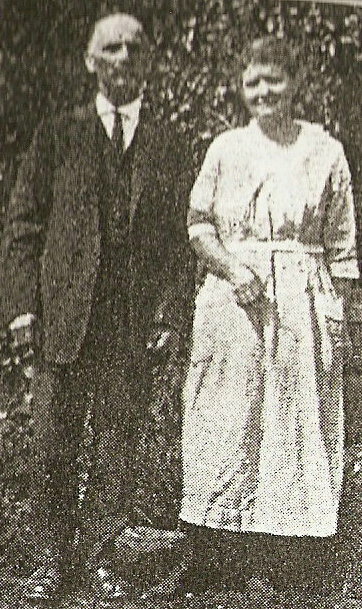 William Hughes, seen above with his wife, was the character immortalised by Caradog Prichard, the Welsh novelist and poet, in his semi-autobiographical work Un Noson Ola Leuad (One Moonlit Night). Set in the slate town of Bethesda, Hughes was fictionalised as Wil Colar Starts (Starch Collar Will), a nickname earned from his choice of attire of a starched white collar following his religious conversion. He lies in Elmwood Cemetery, Middle Granville, not far from my own ancestor’s plot and his memorial proudly carries the name of his Welsh home. No doubt, William Hughes is sleeping soundly with my great-great-grandfather and the other Welsh folk at Elmwood; and I’m pleased to say that little Gruff’s slumber has given me some time to write this blog tonight too. The stars are out tonight. The moon is low on the horizon and shaped as a hammock as though it is telling me to go to bed, so I’m going to go up now, if you don’t mind! I can recall my mother singing a traditional lullaby to me and my siblings in days gone by, Suo Gân, ( SIH-oh garn) another song that makes me glad to be Welsh. I’ll let Bryn Terfel’s version of it rock you to sleep now while I tiptoe upstairs past Gruffudd, my little star’s room! Please, Gruff…….sleep all through the night…….ar hyd y nos! This entry was posted in Uncategorized and tagged All through the night, Ar Hyd y Nos, Cae Star, Ceiriog, Middle Granville. Bookmark the permalink. 2 Responses to All through the night! Very intertesting! I was reading some letters sent to Lord Penrhyn asking for money to allow and elderly man to emigrate to join his family in America, I wonder if there was a connection to William Hughes? Very interesting to read about the slate story from the other side of the pond, and especially to read about things that happened probably as a consequence of the documents I’ve been reading. Perhaps the diffculty of times over here gave a fortunate few the chance of a better new life over there. Good luck with Gruff. I had a little bundle of joy join me in May too, and I can sympathise! I am a great grandson of William Hughes and I have to tell you that it was wonderful to read this. I’m off to order a copy of One Moonlit Night.